“Are you saying you DON’T trust him?” Wyn asked. She looked rather fierce as he spoke and Alec had the oddest feeling that if they were in a school playground he’d be challenged to a fight at any moment. “No, I don’t know.” Wyn really DID look like she was about to challenge him to a fight for the honour of The Doctor. Jasmin blushed and protested her innocence, but the blush was the give-away. The Doctor smiled to himself and wondered if he ought to tell them that Time Lords have exceptional hearing. It was no news to him that Jasmin had a ‘thing’ for him. But it wasn’t anything that could harm her relationship with Alec. Wyn, bless her, had her mum’s loyalty to him. She would never hear a bad word, either. She used to defend him to the Brigadier with a fierceness that shook the dyed in the wool military man. And as for Alec, he was right. There were a lot of unanswered questions. Some of them always would be. Some of them he didn’t know the answer to himself. Secrecy was a mantle he put on centuries ago, back when he and Susan lived in a junk yard in London and tried not to draw attention to their differences. Before then, even, on Gallifrey, as the political situation became more complicated by the day. Anyway, it was a long time. He had just become used to being a deep, complex person and knowing that even those closest to him hardly ever scratched his surface. The space – and they clearly WERE in space - seemed to be going through the colour changes of an evening sunset. There were reds, oranges, russet browns, bright yellow…. “He’s talking to the TARDIS!” Alec said, shaking his head and laughing at The Doctor’s actions. “It’s only mad when they talk back, Doctor,” Alec replied. Then his attention was taken by the console. All the lights were blinking madly and the time rotor was rising and falling as it should, but it was perfectly clear that The Doctor was NOT in control. The Doctor grinned and told them to be nice to any natives they bump into and have a good time then set to work opening up the panels beneath the console. By the time the three of them had found their coats he was knee deep in wiring. He barely heard the door open and close. Such was his concentration on his work that he hardly noticed three hours passing. He was surprised when he realised. It shook him a little. Time Lords, apart from everything else that made them different from the Humans he kept company with more than any other species, have an innate sense of time and place. He was always aware of the passage of time. He almost never had to look at a clock. His watch told other things than merely time. So it was strange that he should have passed three hours without being aware of it. It was as if for those three hours he hadn’t aged. Maybe…. The half-formed thought was disrupted by a hammering on the TARDIS door. He glanced at the viewscreen and saw it was Alec. He reached for the door opening mechanism and then crossed the floor to hold him up as he stumbled over the threshold. “I’ve found you,” he cried. “At last.” The Doctor half-carried him to the sofa. He didn’t look badly injured, but every exposed part of his arms and hands and face was covered in scratches and abrasions as if he had been fighting his way through a bramble bush. His t-shirt was filthy and in tatters. He was sweating profusely and his heart was racing madly. “Where are the others?” he asked, trying to keep the urgency from his voice. He needed to calm Alec and if he seemed to be anxious it would not help. He put his hand on his forehead and gently calmed him. He felt his heart slowing and his breath becoming more regular. But he was aware, too, of fear and grief. “Two days?” The Doctor glanced back at the console clock. He lifted Alec’s arm and looked at the time and date on his watch. It showed a difference of nearly forty-six hours. Time in the TARDIS was always confusing when one of his companions came from Earth in 2010 and the others from 2025, and he himself came from a planet that existed outside of regular universal time and had twenty-six hours in the day instead of the twenty-four the others were used to. For clarity the three Humans set their watches to the same time as the TARDIS clock, and that was set to Wyn’s Earth time. Three hours had passed in the TARDIS. Forty-six hours for Alec. “Alec, may I look deeper?” On his own planet, where telepathy was taught in school along with a subject called psychic ethics, it was considered the height of bad manners to read somebody’s mind without permission. He found it even more important to ask when the subject came from a race that didn’t have the ability. Alec nodded numbly and allowed The Doctor to put his hands either side of his head and reach inside. “You came to an archway, a grand looking thing across the path you followed. You all three walked through together, but when you came out the other side you were alone.” The Doctor looked to Alec for confirmation. “You turned and went back but the landscape had changed. Both sides of the arch were now a deep, dark, impenetrable forest and you had to cut your way through with a penknife.” Alec went into his pocket and pulled out a multi-purpose pocket knife. All three of the blades were broken and even the bottle opener, corkscrew and strange tool that was supposed to remove stones from horse’s hooves looked chipped and bent as if he had used them as a last resort. Alec nodded and went to do as he said. The Doctor watched him thoughtfully. His memories were of two days struggling through that jungle. His physical condition confirmed it. But his body clock denied it. That innate understanding of time meant that he could tell to a second a person’s age by looking at how old their body thought it was. Alec’s body was swearing on oath that it had only just gone out of the TARDIS for a couple of minutes. And it was thicker still when Alec returned to the console, looking slightly damp from the shower but in a clean shirt and with a can of cola and a sandwich. He stood well back from the console with his snack. The one strictly adhered to TARDIS rule was no liquids near the controls, but he watched as The Doctor studied the data screen on the environmental console carefully and bit the inside of his cheek in puzzlement at the feedback he was getting. “Oh.” Alec took this news philosophically. Maybe it was the way The Doctor broke it in such an after the fact way, but it didn’t seem to worry him as much as what had happened to Jasmin and Wyn. And that was REALLY starting to bother him. Before, he had been too relieved to find the TARDIS. He had HOPED they were already there. They stepped out of the TARDIS and The Doctor looked around in surprise. He could FEEL the effect even more acutely now - the lack of time passing. Alec couldn’t feel it, of course. Humans wouldn’t. But he was distinctly aware of it, like the biological equivalent of putting a DVD on pause. “Yeah, right, Doctor,” Alec grinned and watched as The Doctor unrolled the length of washing line and tied an end of it around his waist and offered the other end to Alec. “Simple, tried and trusted method of sticking together when we go through,” he said. “Well, of course you do,” he answered with a grin. “Come on then…” He stepped forward. Alec was beside him and he was only a little surprised when he reached and grasped his hand. As they stepped under the arch, though, The Doctor felt his grip slacken and when he looked around Alec wasn’t with him. He pulled the rope and found the end of it but no Alec. “I thought that might happen,” he sighed. “Doctor!” Alec yelled as he found the end of his piece of rope. He looked around and was at least relieved to see he wasn’t in the forest again. But where WAS he? “How long have you been here?” Alec asked. “What’s an Orcaion?” Alec asked, although in fact that wasn’t his most pressing question. “That is,” Wyn said as something with tentacles rose up out of the otherwise placid water. Wyn grabbed a heavy club that lay beside her on the jetty and whacked the tentacles until the thing gave up and dived down under the surface again. Alec followed her along a narrow path that came, presently, to a group of mud and thatch huts with very low doors. Wyn ducked inside one of the huts. Alec followed her. “This is Mak and Roo,” she said, introducing the two occupants of the hut. Alec nodded politely at what he would describe as pygmies. They were no more than three feet high but perfectly proportioned humanoids with open, friendly faces. “I stay with them. They don’t charge rent as long as I catch plenty of fish. They’re a nice couple.” She gave Roo the basket of fish and she took them and skilfully filleted them before cooking them on a stove in the corner of the room. Within a short time she was serving them to them all with some kind of green vegetable. Alec didn’t like to ask what it was. It was hardly polite to question food that was offered willingly. “We should do the washing up first,” she said and Alec thought there was something in her eyes that made him think she was forgetting again. “The way out is up?” Alec looked around as they came out of the pygmy hut. His eye stopped on the sheer mountain side that rose up behind the village. He could swear it wasn’t there before. This place WAS weird. But halfway up it, on a sort of plateau, was a blue box that didn’t belong to this planet. It looked the size of a thimble from there, but it WAS, definitely, the TARDIS. Jasmin was getting scared. The house had looked nice from the outside - the sort of house where nice, normal people might live. But it didn’t look like ANYONE lived in it, and she couldn’t get out again. She looked at the window once. Outside there was nothing but a sort of wall, pressed right up against the window. Somebody had built a wall around the house while she was inside. The windows wouldn’t open. The door just came to a dead end. It covered the roof, too. She had gone up to the attic and tried the skylight, but there was a wall across THAT, too. She was trying to work out how long it would be until the air ran out. It seemed to be okay so far, but there had to be a limit. A few hours? A few days? She didn’t know. And then there were the rooms. They were weird. She had been lost in the library for hours - not because it was a big library, but because it just didn’t seem possible to get out of it. She came into it in the usual way - from the landing on the second floor. She was a bit tired by that time, having run around all over the house looking for windows that didn’t have a wall in front of them. There was a big armchair that looked comfortable. She sat in it. It WAS comfortable. She let herself relax for a little while, then a little while longer. It was too cosy to move just yet. “Are you all right, Wyn?” Alec called out as he edged around the narrow part of the mountain path. He kept his eyes looking straight ahead. He wasn’t going to do anything so dumb as to look down, and up was no better. He moved sideways a little more, then a little more. Wyn edged along after him. She was doing her best not to whimper. She was scared. Alec was scared too. The down he didn’t want to look at was terminal. If either of them fell there was no hope for them. “I wish The Doctor was here,” Wyn said. “I’m nearly there. Just… one…more…step. Here… Wyn… take my hand.” He reached back around the jutting rock that had caused them so much trouble. A hand grasped his, but he was pretty sure it wasn’t Wyn’s. It was way too hairy. He looked around and saw what looked like an orang utan climbing down the rock face. Which struck him as odd in so many ways. Orang Utans didn’t DO mountain climbing for one thing. It grinned at him and chattered in Orang Utan, and then let go of his hand and carried on climbing down the mountain. He watched it dumbfounded. “Should have asked it if it had a spare rope and some crampons it wasn’t using,” Wyn said. “Here’s my card, come see me in my office any time,” said the eminent psycho-analyst Carl Jung as he sauntered past, apparently not at all worried about the precipitous path ahead of him. Wyn looked at the card and tore it into very small pieces. “The Doctor says you’re a fraud and so is your mate Freud,” Wyn shouted after him. “Well, this mountain is real enough. And…” He looked up at the TARDIS. It was closer now. He was glad of that. He’d wondered if it was going to be a mirage that never got any closer and just teased them to the top of the mountain only to disappoint. He thought he might just start to go completely nuts if that happened, but so far the TARDIS looked wonderfully real and solid and it was the one thing keeping him going. Jasmin woke up from her nap, feeling slightly fuzzy as she always did when she slept in the afternoon. If it WAS afternoon. She glanced at the horrible walled off window and sighed. Better try to find some way out, she thought. She stood up and went to the door. She opened it and stepped through. She turned around and opened the door and looked. The door led to the library again. She walked through the door and this time left it open. She looked from one library to the other. She stepped from one to the other. They WERE identical. Except…. She picked a book from the shelf. It was in mirror writing. So this was not the real room that she first came into, because she knew that had ordinary books in it. She had looked at a couple of them. They were mostly fantasy novels - the usual stuff: Tolkein, Lewis, Pratchett, and some guy called Rousse who she’d never heard of, whose stories seemed to be pale imitations of all the others. She wasn’t even particularly interested in GOOD fantasy stories. She wasn’t bothered about bad ones. She did wonder if this was Rousse’s own library, since there seemed to be a LOT of his books in there. One of them was on the table by the chair. She picked it up and opened it randomly and read a paragraph. It was about a girl stuck in a weird house with no way out and where doors led into the same room time and time again and sometimes the room was reversed like a mirror. She spent so long running from one room to the next that when she stopped and looked in a mirror she had aged twenty years. “What a load of rubbish,” Jasmin said and dropped the book. Even so, she glanced at the mirror over the fireplace. She was reassured by the young, fresh face that looked back at her. And something else, too. She turned around and wondered why she hadn’t seen it before. There was another door from the library. It was hard to spot because it was in a dark corner between two of the big built in shelves. But it was a door. She closed her eyes as she went to wrench it open. She dreaded seeing another library inside. The Doctor was tired. He’d hacked his way through the forest for what might have been hours or days, but was probably only a few minutes. His body clock still felt like it was stopped. So was that a good thing or a bad thing? He wondered. Bad, because it wasn’t normal. Even in the TARDIS, zipping through time and space, time, actual time, passed. He’d lived several centuries in it, and despite external appearance he had certainly aged a thousand years. Aging, time passing, was normal even for a Time Lord. There was light ahead. He could see it. He hacked once more and came out of the forest. He stepped into the clearing and stared at what he found there. Wyn and Alec reached the plateau. For a moment they just stopped and stared at the TARDIS and thought it was the most beautiful thing in the world. They hardly noticed the man sitting dejectedly by the door until he spoke to them. “Course I do,” Wyn said, taking the key chain from around her neck and putting the key in the lock. One hundred and eighty degrees clockwise. Ninety degrees anti-clockwise. Any other combination, The Doctor had told her, caused the lock to shut down and set off a very loud, penetrating and irritating alarm in HIS head. She didn’t want either thing to happen so she was very careful to get it right. “Come on in then, if you’re coming,” she said to the man. He scrambled to his feet and followed her and Alec inside the TARDIS. It looked like shell, or some kind of limestone accretion over what he guessed was a house underneath. He stepped closer and touched it. Yes, it definitely looked like something that had grown up around the house and then hardened. He raised his axe and hit it. It cracked with a very satisfactory noise. He hit it again and a piece broke off. The shell was only about an inch thick and very brittle. It wouldn’t take long to uncover the front door. Jasmin opened her eyes and was relieved to see she was out of the library at least. This room seemed to be a playroom. It was full of toys, the sort of toys found in an old fashioned nursery, a big spotted rocking horse and a nearly lifesize clown and a dolls house and puppet theatre. There was a table in the middle of the room and she looked and saw a half-made jigsaw puzzle on it. The picture was of the very room she was standing in. The rocking horse and clown were both nearly completed, so was the dolls house. She could even see part of the library through the door along the completed straight edge. There was nothing for it but to put the rest of the pieces in place. She did so with a touch of fear. 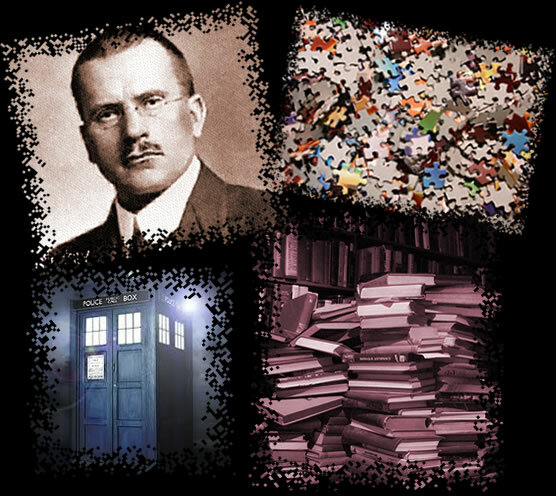 It was the oldest urban myth in the universe – somebody making up a jigsaw which was a picture of themselves making up a jigsaw and there was a piece missing and the piece showed a monster at the window or a mad axeman in the room or something horrible. That seemed to be to plan so far. The jigsaw showed a perfectly clear picture of a pretty Asian girl with long black hair, bent over a table making up a jigsaw. And there WAS a piece missing. It was the piece that showed what was behind her. She didn’t dare turn around. She could HEAR the sound of somebody breaking down doors with what had to be an axe, but she couldn’t move. She was frozen with fear. She waited as the footsteps drew closer. She froze in fear, waiting for the axe to cleave her skull in two with a brief moment of pain and then oblivion. The Doctor stepped beside her and dropped the final piece of the jigsaw in place. “Silly story isn’t it,” he said. “The only people who could possibly be scared of it are college students around a campfire telling ghost stories.” She looked at the picture and it had changed, quite improbably, to a picture of the two of them standing together in the sudden sunshine as the shell completely shattered and the house was free at last. The man nodded miserably. The Doctor looked at him and grinned at his three companions. They all looked attentively at him, recognising the signs that he was about to say something interesting. “Did I ever tell you lot about the second shortest sci-fi story in the universe?” The Doctor asked them. There was a silence for a moment. “I never did,” Alec repeated. He turned and looked at Mr. Rousse. They all did as the reason why The Doctor had given them that parable dawned on them. “And neither can we,” Jasmin murmured. 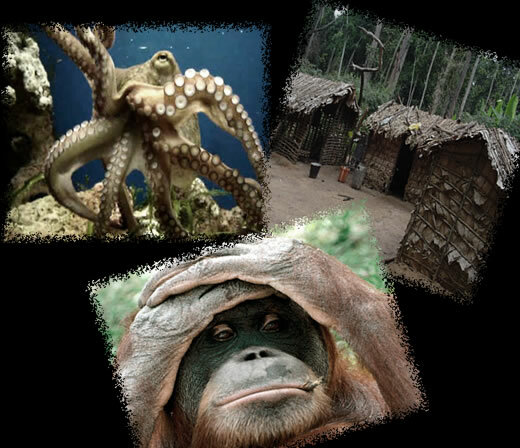 “The Orang Utan was very polite,” Alec admitted. Jasmin murmured something about a library and a jigsaw puzzle. “What do you mean, know?” The Doctor asked suspiciously. “And you sucked us into your insane fantasy!” Alec looked angry but The Doctor put a restraining arm on him. “So… if you wrote something down… it would happen?” Wyn asked. There were no chairs, in fact. The Doctor always stood at the console. But there WAS a functioning word processor. Rousse stood before it and looked at The Doctor. “Type this,” he told him. And Rousse began to type as The Doctor dictated to him. “The Doctor moved to the navigation console and typed in the co-ordinate of Rousse’s study in his house in Surrey where he was last seen, because The Doctor had realised that Rousse never went ANYWHERE. He had been trapped in his own books, in his study. Therefore they were ALL still in his study. And because he knew that he could get them out of this strange place, this fictional place where time and space didn’t exist.” As he spoke, as Rousse typed, he went to the Navigation console and set the co-ordinate. Everyone held their breath as the time rotor began to rise and fall and the familiar sound of the TARDIS dematerialising was heard. They hardly dared breathe again until they saw the TARDIS materialise, a few minutes later, in a rather untidy study in a suburban house on Earth, in the spring of the year 2026. “My house!” Rousse cried. “I’m home.” He ran to the door. It didn’t open. He looked around.